I’m giving up. I won’t be formatting my own books. Why is giving up so hard to do? Admitting one can’t do something is seen as a sign of failure by others but, for me, I’m giving up because it’s the right thing to do. I’m a lucky girl. I live in an amazing place. 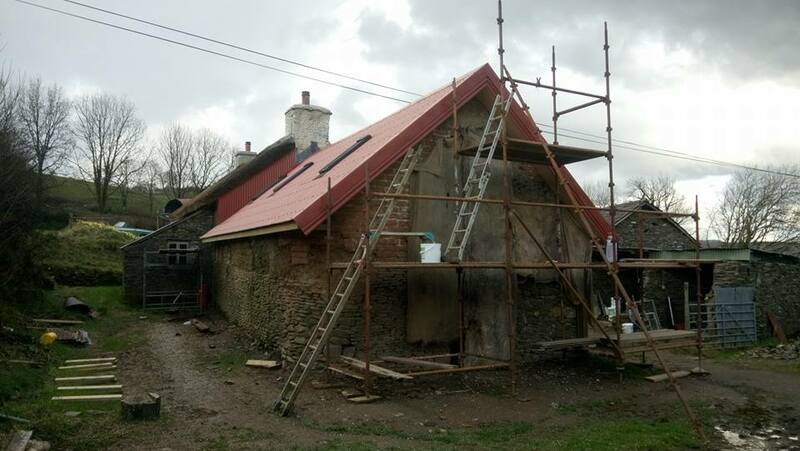 Now the weather is dryer, we’ve work to do on the house and byre. 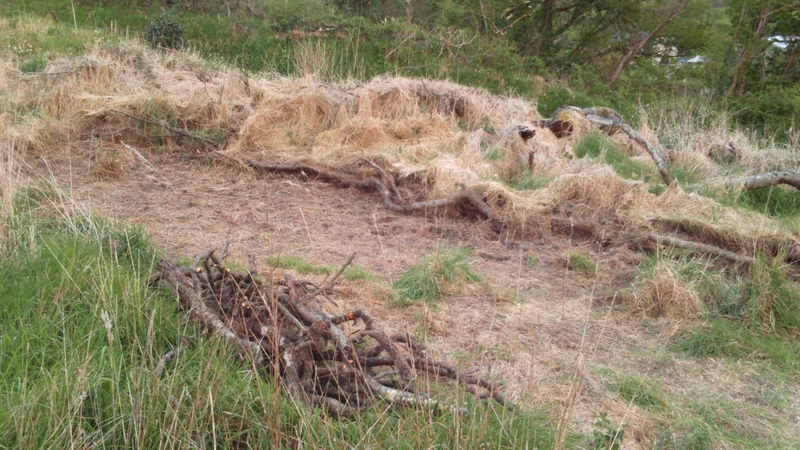 Last year, the farmer who bought the rest of the land originally attached to our house grubbed out the old hedges and laid new ones, dumping half the wood in our field. 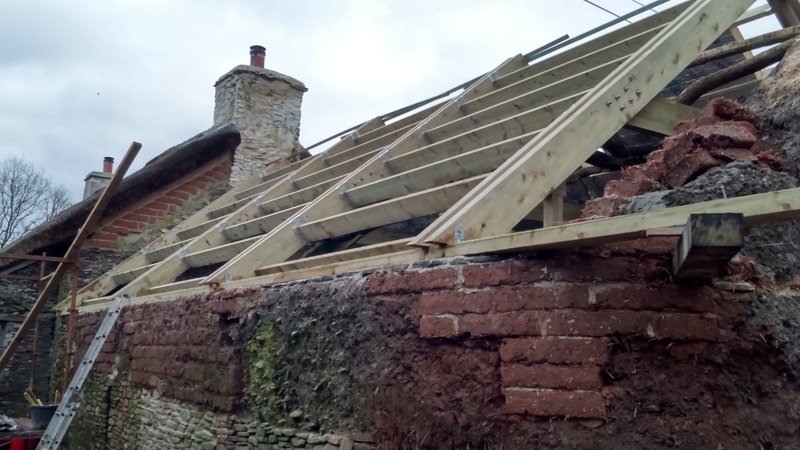 We’re working through that to keep us warm next winter. My partner chainsaws the wood and I follow behind, picking up the logs, stripping off the branches and loading them into the car. 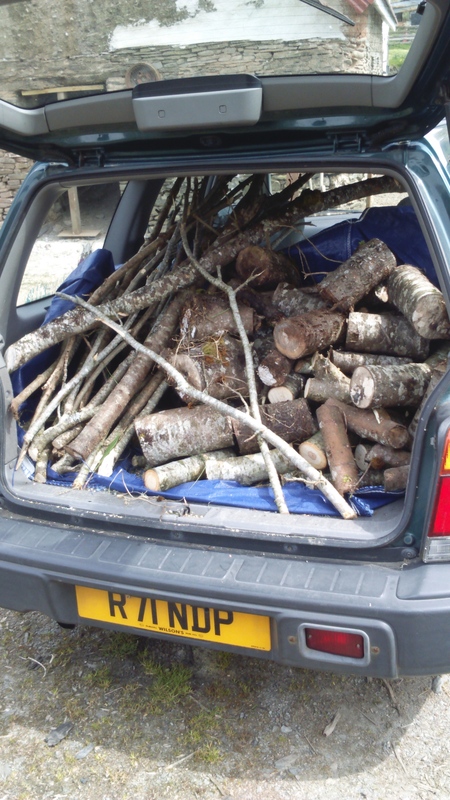 A drive from the field to our drying barn and then the wood is barrowed to its new home. 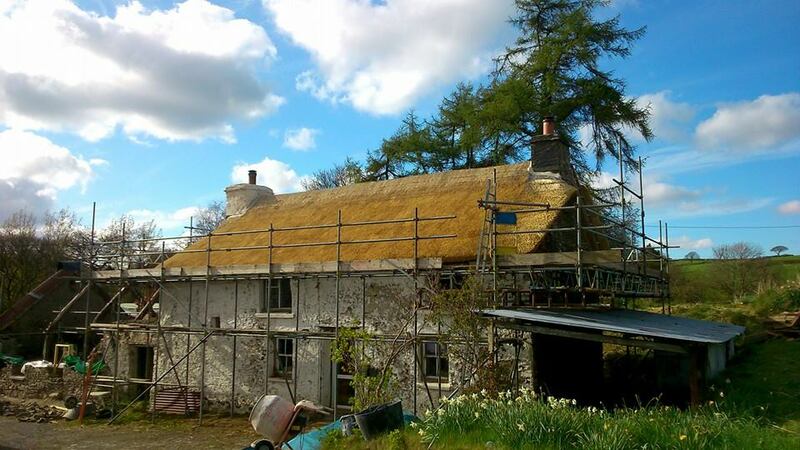 Our beech tree had to be taken down last year and much of the wood became grassed over as we battled to get a roof on our house and save the byre. 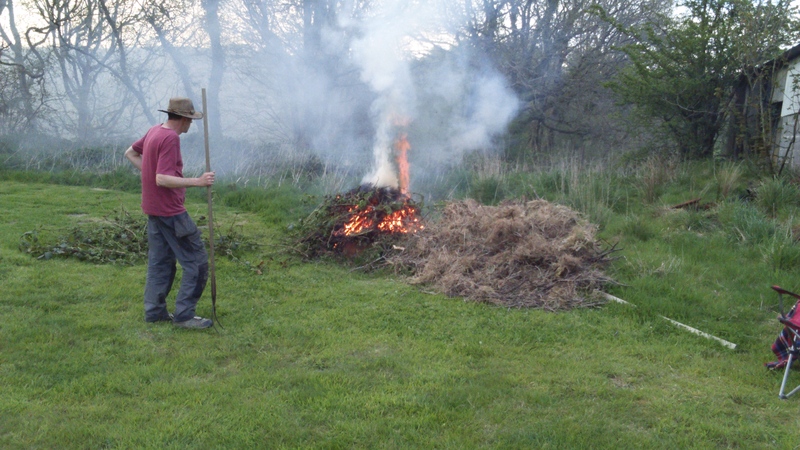 Stripping away the old grass and twigs for the bonfire and making piles for my partner to chainsaw has become a priority to stop brambles and nettles spreading across the field. Once clear and the old broken fencing dug out, this area can be mowed. 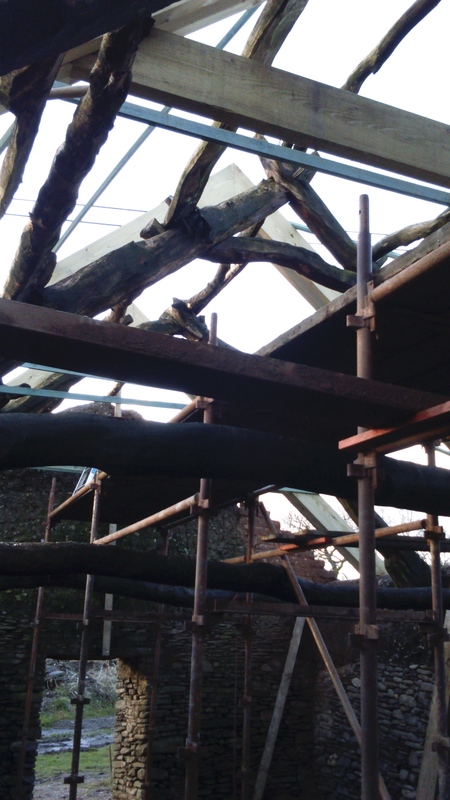 We’ve old baths to make raised planters and an old conservatory to recycle into a greenhouse. On top of all this, I teach dance which I love and write the stories in my head that insist on being told and attempt to market them to readers to enjoy. So is giving up and paying someone to format my books a sign of my failure? A month ago I read a blog post about what you need to do to be a successful writer and it made me angry. The gist of the post was that if you don’t give up your life, put aside the things you enjoy and spend every waking moment on social media, you don’t care about your writing. My life makes me the person I am, the person whose head is full of stories and who loves to inspire others with books and dance. Working on my house and land is a challenge and I’ve learned many new skills. So you won’t find me on social media all the time and I won’t be formatting my own books. I will be living my life, inspired by my environment and the people I meet and focussing on what I do best. Having been nursed and tended by the professionals, with a bit of help from us, we finally take charge of our baby. We began making lists…and added them to the fire! Lists longer than your arm are far too daunting so we’ve allocated four priorities we want to achieve by the end of the summer and we’ll see how we go from there…the truth is, our funds are depleted and as we approach three years in Wales, tent, caravan and house, we need to start living here. 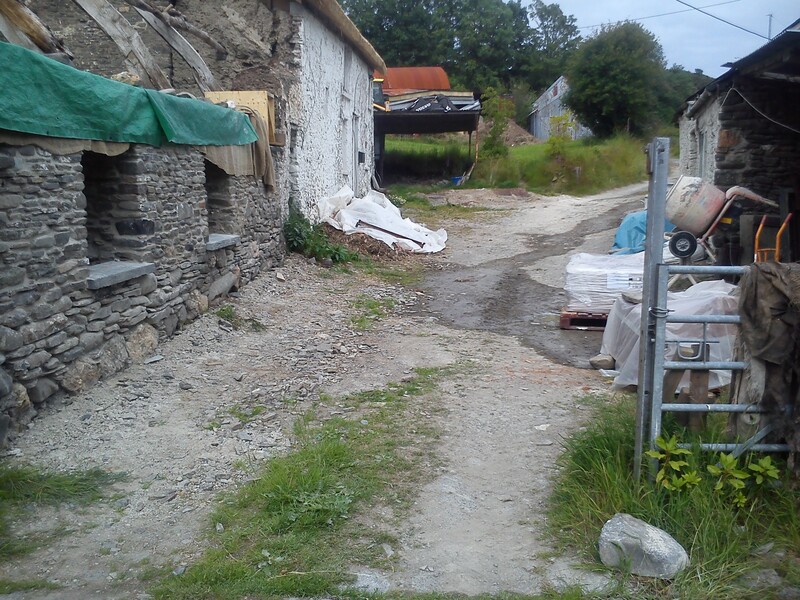 So the outdoor stage stays… and we’re going to construct one under cover in the byre. 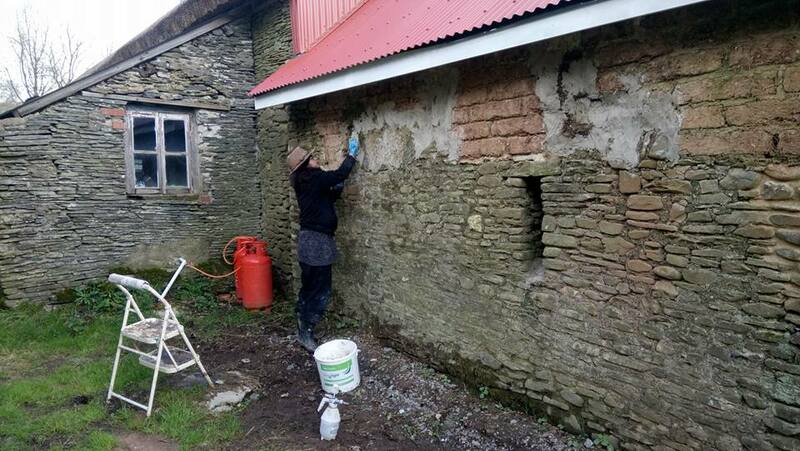 Soffit painting, lime mortar ‘dobbing out’ on the walls needs to be finished on the byre and the gable end of the house also needs finishing. 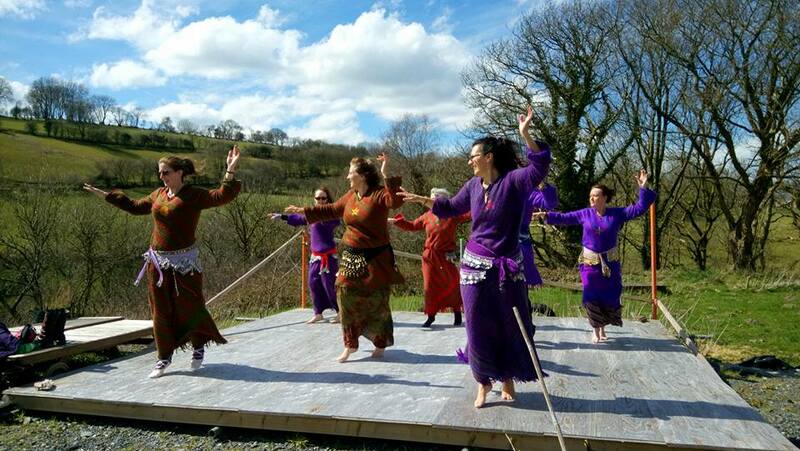 My partner is going to build a straw bale building inside his workshop…a soundproof, watertight room, ideal for planing wood and recording music and we’re going to dance and sing our way through the spring and summer. We love living in Wales and we plan to enjoy it. I’m a simple soul. 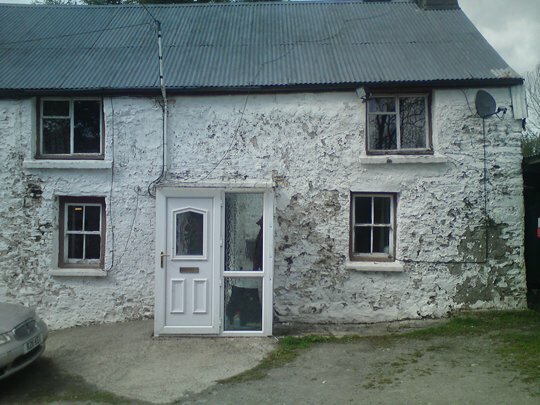 With a roof over my head, hot water to wash with and basic veggie food, I’m a happy bunny but so far, in our little Welsh farmhouse, we’ve not had much luck with roofs. 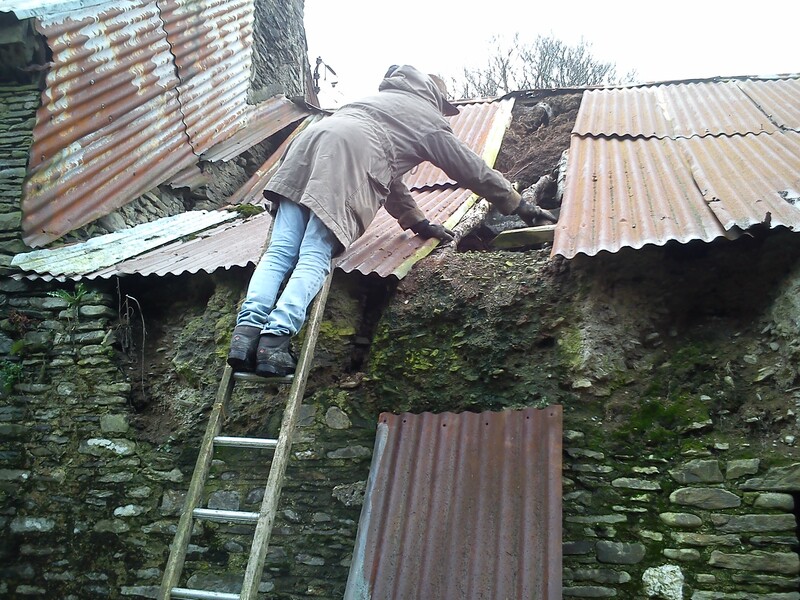 How excited I was last year when the thatch went on but since then, it has continued to leak and our upstairs is still unliveable. 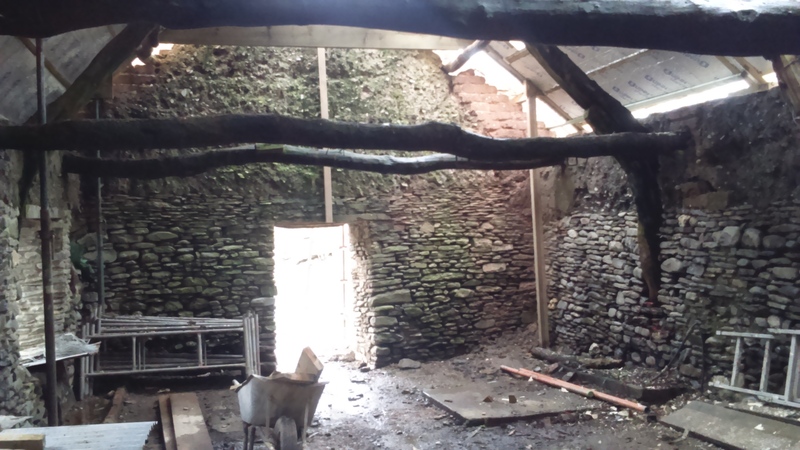 It’s been much the same with the byre…waiting for responses from CADW, work had to stop and then the letter came, intimating they may consider granting us a pittance but requiring an excessive amount of hoop jumping and no guarantees of help. 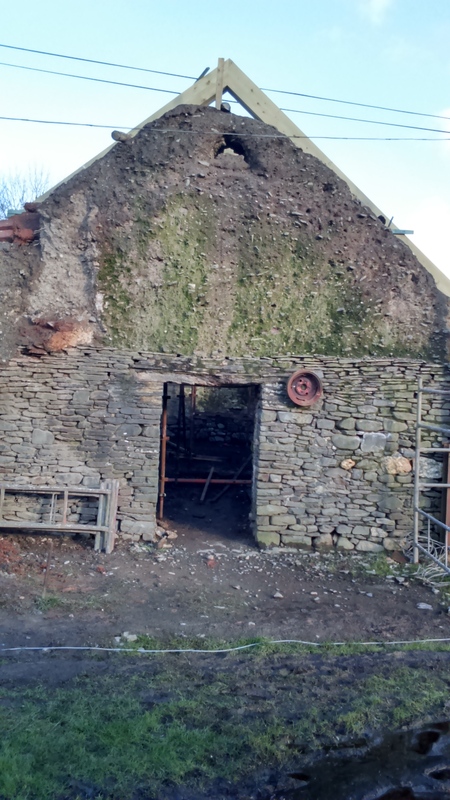 So we’ve carried on ourselves, the last of my inheritance going into the byre but always knowing we didn’t have the money to finish it. 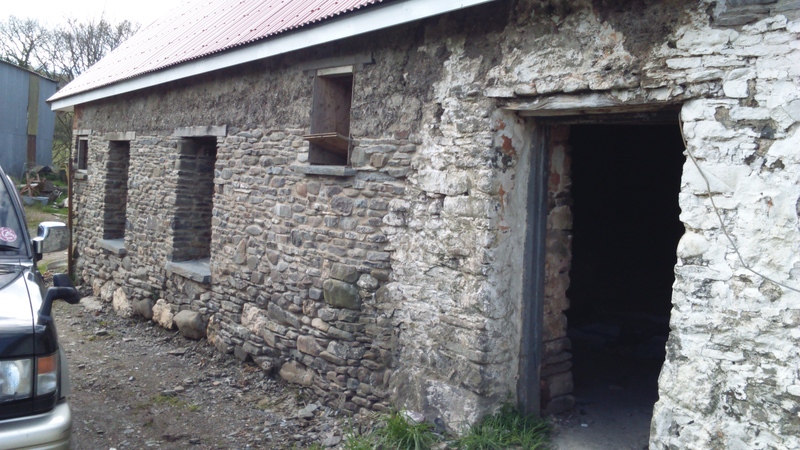 This was how the byre looked in July 2015. 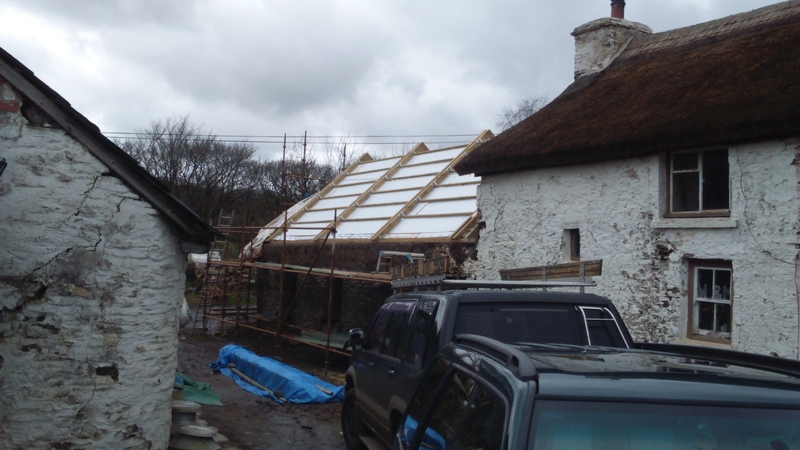 The weather at the end of last year held up work as the clom wasn’t drying and wouldn’t support the roof. 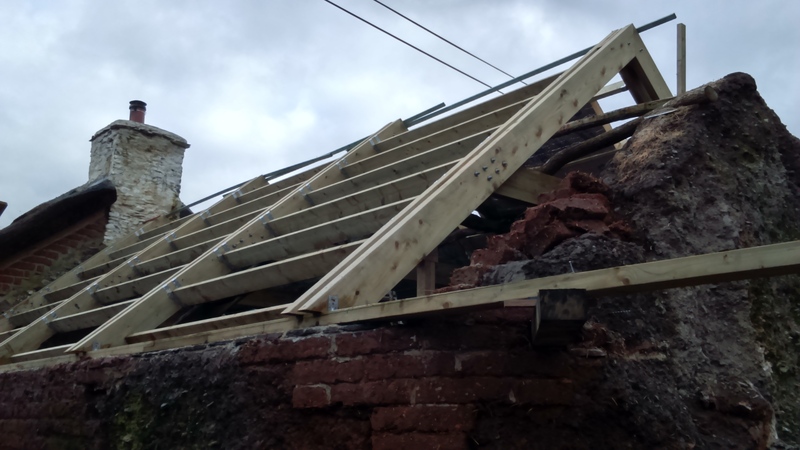 The builders tried and did a good job covering what they had done but hours of work were washed away while we waited for CADW. 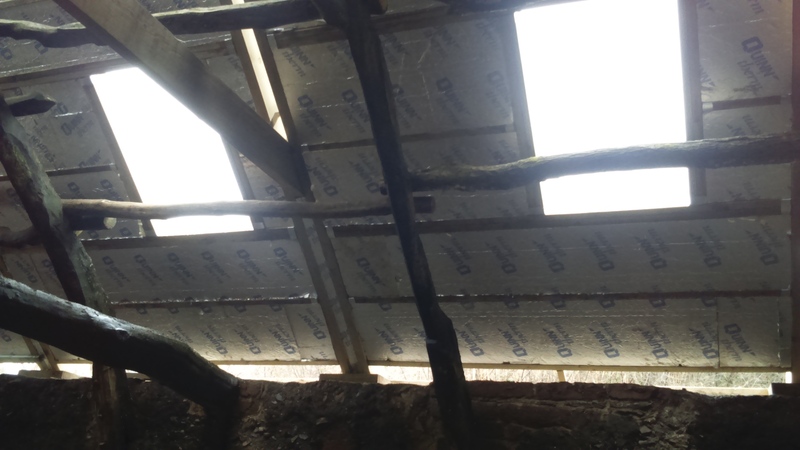 Architects, structural engineers and building inspectors were brought on board to finalise the roofing plans and in February 2016, work began again. Swathed in scaffolding, the little building felt happier inside, as if it knew it was being loved again. 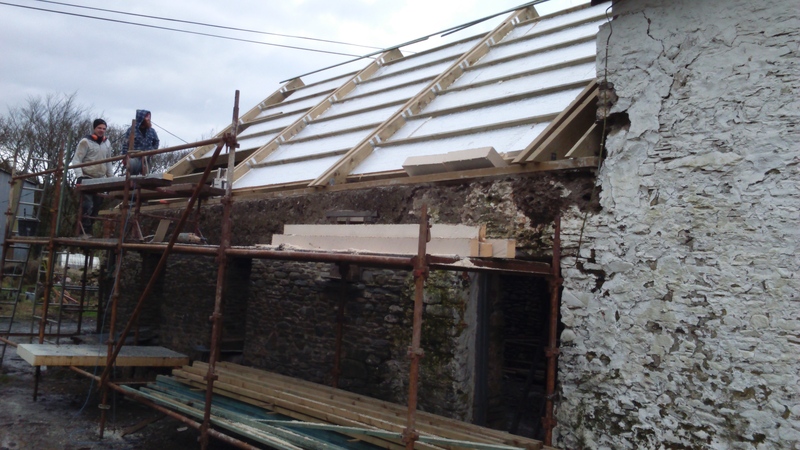 With the roof trusses in at the end of February, our hard working builders worked through hail and snow to get the insulation on Finally, the byre is looking like part of the house After much deliberation, we decided where the skylights should go…it’s very hard to decide how a room is going to be used when it looks like a cow shed! Now the scaffolding is down, the inside feels amazing. 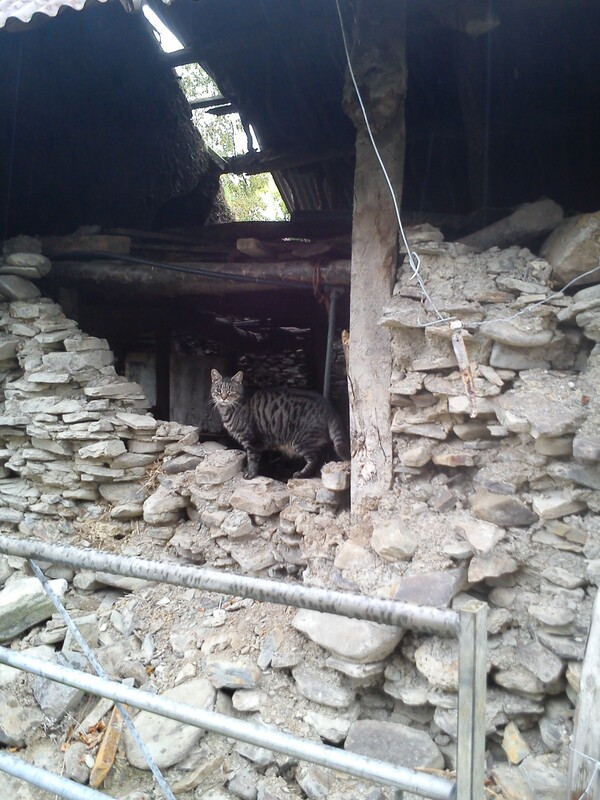 The building inspector came this morning and he was pleased with the work. 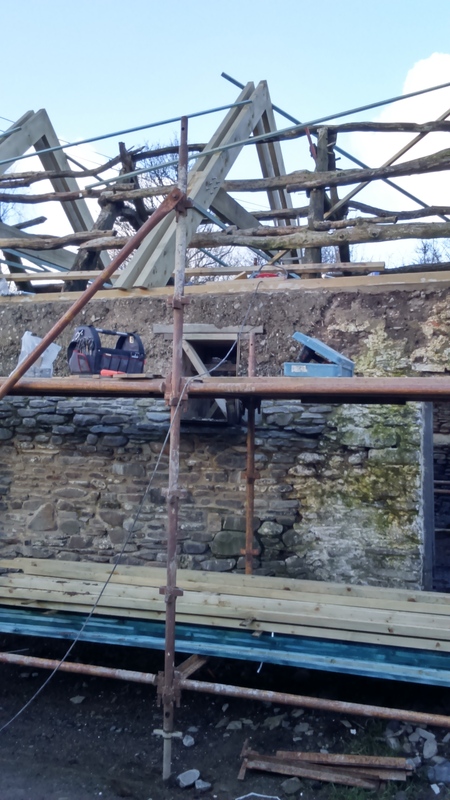 Sympathetic to this Grade II listed building, we won’t need to insulate the walls but we will the floor…not a worry for us as once the roof is finished and, hopefully, doors and windows in, we will have run out of money. 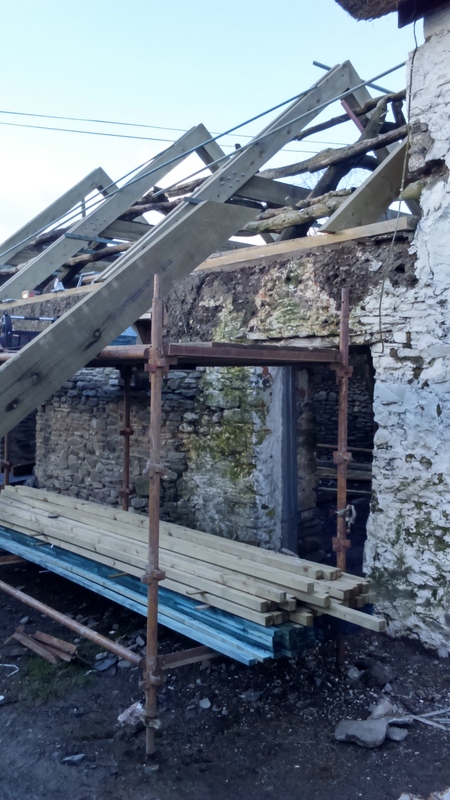 So the byre, one day to be our kitchen and social hub of the house, almost has a roof and the building has been saved for future generations to enjoy.